eremy Clarkson shares his opinions on just about everything in The World According to Clarkson . Jeremy Clarkson has seen rather more of the world than most. He has, as they say, been around a bit. And as a result, hes got one or two things to tell us about how it all works; and being Jeremy Clarkson hes not about to voice them quietly, humbly, and without great dollops of humor. In The World According to Clarkson , he reveals why it is that too much science is bad for our health, 1970s rock music is nothing to be ashamed of, hunting foxes while drunk and wearing night-sights is neither big nor clever, we must work harder to get rid of cricket, and that he likes the Germans (well, sometimes). With a strong dose of common sense that is rarely, if ever, found inside the M25, Clarkson hilariously attacks the pompous, the ridiculous, the absurd, and the downright idiotic, while also celebrating the eccentric, the clever, and the sheer bloody brilliant. 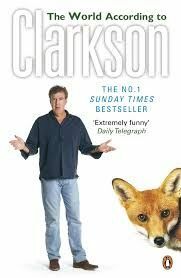 Less a manifesto for living and more a road map to modern life, The World According to Clarkson is the funniest book youll read this year. Dont leave home without it. The World According to Clarkson is a hilarious collection of Jeremys Sunday Times columns and the first in his The World According to Clarkson series which also includes And Another Thing ; For Crying Out Loud! and How Hard Can It Be?